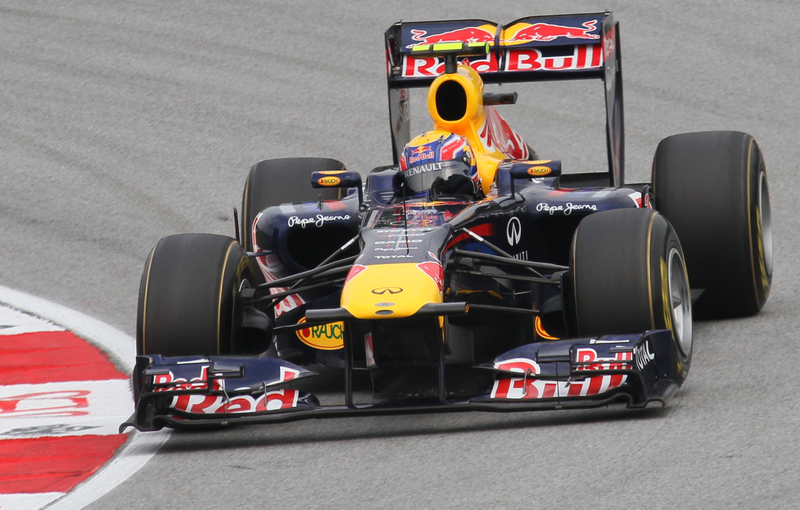 Not for the first time in 2011, today's race in Brazil was all about the Red Bulls. But what did happen for the first time this year, indeed for the first time since July 2010, was that Mark Webber won the day. It was made possible by car problems for Sebastian Vettel, making it the second time in two races that Seb's been hobbled. Seb did his usual thing of blasting off from pole into a clear lead in the early laps. Indeed, he was 2.2 seconds clear of his chasing team mate Webber in second place after just two tours. But from the fifth lap Seb's gearbox developed a problem, which forced him to short shift in second and third gears. Webber thus was able to reel him in gradually, and on lap 30 Seb yielded the lead to him graphically. Still, such was the Red Bull advantage Seb managed to nurse the thing home in second place, behind Webber who won as he liked. Such a state of affairs, the other teams not even being able to out pace an RB7 with a sick gearbox, must have been rather galling to everyone else. But that's another thing that happened not for the first time today. The win will be a relief for Webber, even if it was by default to an extent. Going through a 19 race season with the stellar RB7 underneath him and not to win a race would have been an unwanted record. Still, he was never far off Vettel's pace today and didn't put a wheel out of line that I could see. He even managed to 'do a Seb' by claiming fastest lap on the last time around. In a season where Seb's Red Bull has functioned like a watch at the front of the field it's notable that, with the championship wrapped up, he has had technical problems in the last two races of the year. This is something of a recurring feature in the history of F1 however, that a driver who wins a championship with races to spare by finishing just about everywhere can often suddenly be impeded by technical problems once the title is in the bag. It afflicted the likes of Nigel Mansell in 1992, Nelson Piquet in 1987, Emerson Fittipaldi in 1972 and Jim Clark in 1965 (and I'm sure there are others). I recall Jackie Stewart saying that once a championship is won somewhere down the line, and by fractions, relaxations occur and they add up. History always repeats itself in F1, as in most things. There were a few conspiracy theories swirling around about Vettel's gearbox problems, some reckoning it was all staged to give Webber a win in 2011 as well as help to bump him up the drivers' table order. I have to say I'd be surprised if this was the case. For one thing, it seems an awful lot of trouble to conceal a move (swapping the drivers' order) that would have been well within the rules. For another, perhaps I'm incredibly naive, but if it was a ruse then Rocky, Seb's engineer who sounded increasingly agitated in his radio messages, is a very good actor. Behind the Bulls, Jenson Button secured his second place in the drivers' standings by completing the podium, in third. He struggled in the early laps today, and was victim of a mighty overtake by Fernando Alonso around the outside of Ferradura. But he got the place back late on when he tore chunks out of Alonso's advantage in the final stint, the Ferrari once again not liking the harder tyres, and passed him in the DRS zone on the bottom straight. It was a pity for Alonso, as a podium would have been fitting reward for yet another combative and relentless effort. For another thing, the place lost allowed Webber to pip Alonso to third place in the final drivers' standings, which given how the Spaniard has driven this season also would have been an apt achievement. Still, getting with a point of a Red Bull driver after 19 races in a car that rarely seemed up to things is testament to how he's performed in 2011. Button's pass also demonstrated a definite downside to DRS, as Alonso was quite helpless to defend the move. Even though Button, given his pace advantage, in all probability would have passed him anyway it would have been nice to see him try and for the battle to pan out 'naturally'. Defending ones position against a faster car has always been part of the skill of an F1 driver, and I worry that DRS has rendered the skill obsolete. I always have been willing to give DRS the benefit of the doubt, but it has rather been piling up on the unintended consequences in recent races. In terms of the other issues to be resolved this weekend, Adrian Sutil put in another great drive to finish sixth; ahead of both Mercedes. This also means he finishes ninth in the drivers' table. Sutil has definitely been on the top of his game in recent times. It remains to be seen whether this will be enough to retain his Force India drive against the odds, or to get him a seat somewhere else like Williams (especially as Raikkonen to Williams seems to be dead in the water). On the flip side however, if you're being hyper-critical you'd ask where this performance has come from with Sutil, and why he's coincidentally extracted it at the same time that he's driving for his future. 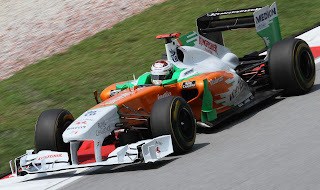 Sutil's sixth, allied to eighth place for team mate Paul Di Resta, wasn't quite enough for Force India to take fifth place in the constructors' standings from Renault. They ran out of races and ended up but four points adrift of them. Few however would have thought after two races this year that it would end up that close. Further down, Sauber edged out Toro Rosso for seventh place in the table. Kamui Kobayashi scored two points for ninth and Toro Rosso scored none at all; their recent pace having evaporated in the last two races when they most needed it. And, unfortunately, neither Bruno Senna nor Rubens Barrichello were able to convert their good grid slots into a strong result - traumatic for the home crowd and for both drivers' future prospects. Senna got into a clash with Michael Schumacher early on which resulted in Schumi having a puncture and Senna having a rather harsh drive-through penalty for another altercation that looked for all the world to be a racing incident. That, plus subsequent gearbox problems, meant that seventeenth was the best he could do. Rubinho's day was ruined by a poor start which lost him seven places, thus fourteenth place was all he could salvage. Whether we'll see either on the grid in 2012 is far from certain. No such worries for the Red Bulls, who end the 2011 pretty much as they started it. In reality, the 2012 season has long since begun; the cars will be a long way down their development line already. Still, it's clear that the other teams have a lot work to do get on terms with the Bulls come pre-season testing in but a couple of months' time.